Justin Bieber, Canadian wunderkind of pop music, has a virtually squeaky-clean image so far, but there’s a dark side that’s waiting in the wings, and eventually it will have to come out of hiding. Bieber was born March 1, 1994 in London, Canada, and raised by a single mother as a devout Christian. He taught himself to play guitar, piano, drums and trumpet while growing up. After placing second in a local talent competition at age 12, his mother posted a video of his performance on YouTube and continued to post others of him singing R&B ballads. A year later he was discovered by manager Scooter Braun, who introduced him to pop star Usher, and the rest is history. Justin Bieber’s birth time is given as 00:56 AM (source: Astrotheme.com). Note all planetary positions are with respect to the sidereal zodiac. Bieber has a cluster of impressive yogas in the 4th house. His lagnesh (ascendant lord) Mars combines with 4th lord Saturn, 7th lord Venus and 10th lord Sun to form three different Raja (power) Yogas that combine effort with good fortune. Saturn in its own sign gives Sasa Yoga in the 4th, giving a substantive fan base, property holdings and fascination with cars. Four planets in the 4th house form Pravrajya Yoga, a source of spiritual strength in years to come. Moon and Jupiter in the 12th house form another three yogas – a Raja Yoga, a Dhana (wealth) Yoga and a Kesari Yoga, the latter explaining his eminent schmoozability, social networking skills and heartthrob appeal. Bieber’s first single appeared in July 2009, and with his first album in March 2010, he won ‘Artist of the Year’ in the American Music Awards, all when he was running Rahu dasa, Venus bhukti. Rahu is exalted in the lagna (ascendant) and gives results for Saturn aspecting it and Mars its dispositor. Saturn is powerful, and Mars/Saturn creates yoga. Venus has dig bala (directional strength) in the 4th house, primarily giving results of nakshatra dispositor Jupiter (forming three yogas with 9th lord Moon), plus its own yoga with Mars as noted above. In May 2012 while running Rahu-Sun he bought a 10,000-square-foot mansion outside Los Angeles. Sun is in the 4th house in Rahu nakshatra, and thus invokes both Mars, the bhumi karaka (significator of property) and Saturn, the powerful lord and occupant of the 4th, signifying property. To date, Bieber has 27 million followers on Twitter, second only to Lady Gaga. For any artist, politician or commercial enterprise, the 4th house represents their fan, constituent or customer base. Bieber’s strong 4th house, with its own lord Saturn at home, and hosting several Raja Yogas, is a bastion of power. Romantically, Bieber has thus far restricted his public alliances to actress/singer Selena Gomez. Other than a bogus paternity suit dismissed in November 2011, he has thus far been scandal-free, with the possible exception of a speeding ticket when he was pulled over after trying to out-run the paparazzi in July 2012. Could Bieber become the Steve McQueen of his generation, with an irregular love life, and a penchant for fast cars? Certainly the latter is possible. With a packed 4th house that includes Venus, the karaka for vehicles, he could also become another Jay Leno, collecting classic automobiles, perhaps with a bias for sports cars. As for his love life, the prospects for becoming tabloid fodder certainly increase as time goes by. For starters, the Rahu-Ketu axis runs through his 1st and 7th houses, with Ketu debilitated in the 7th and afflicted by Mars. This spells sudden and sometimes unwise attractions. Seventh lord Venus (also karaka for relationships) in the 4th is afflicted by three malefics. This is a classic combination for hedonism, like a turbo-charged engine whose tank is topped up with high-octane fuel, just waiting for the right driver(s) to turn on the ignition. Both the Moon and Bieber’s 5th lord Jupiter indicate the mind, and their house position will indicate where his mind goes. Although his pop star life looms large, for the sake of his privacy, Bieber will increasingly seek seclusion to avoid the paparazzi. The 12th house is also the place of charitable works and spiritual retreat, and with dharma lords of five and nine participating, these may become more evident themes after he runs Jupiter-Moon at age 32-33. But the 12th also signifies pleasures of the bed, and his current age makes that a fascination. When the world’s your buffet, it’s hard to resist nibbling what’s on offer. Once Jupiter dasa kicks in at age 21, that world will increasingly come to resemble a sexual playground. 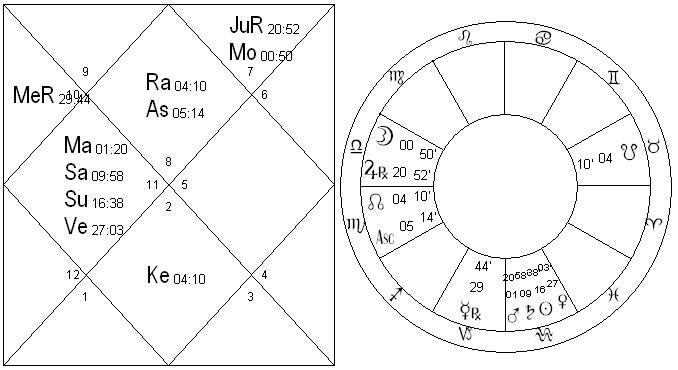 Jupiter occupies its own nakshatra, so its periods will powerfully deliver the results of the 12th house it occupies, and the 2nd and 5th houses it rules. Because the Moon’s there too, the bias will be on the 12th house. Although Jupiter dasa could see a prolific period of songwriting, acting and other creative pursuits, at the end of the day the Bieb will kick back and indulge himself a little – perhaps a lot, since Jupiter is itself the karaka for over-indulgence. Eventually, some of that indulgence will spill over into the public eye. So girls, don’t despair. Selena Gomez has already declared their relationship isn’t that serious, so perhaps she’s seen the writing on the wall. Bieber is attractive and talented, but he’s still very young. By the time he reaches 21, however, he’ll have gained some (sexual) maturity, and he’ll also be very rich and very powerful. Let’s just hope he can negotiate the twists and turns of the Hollywood Babylon hills without rolling his car into a ravine. nicely done! he’s totes not a “straight” person. i’ve been saying this for years without a chart. what do we think of the strong jupiter aspect on the fourth house gaggle? perhaps creating some tension between the self-indulgent hedonistic tendencies and humanitarian altruism/spiritual questing and maybe a little protection from the dark side? or is the retrogression less guru’s grace? interesting that both saturn and jupiter are on their respective principle stars, potentizing the life arc of this tension. perhaps he has a chance to rise above it all, given the succession of saturn dasha after jupiter – with saturn’s shatabisha more of a spiritual/visionary star than jupiter’s despotic/egoistic vishaka. although the nakshatra lord exchange of saturn and rahu is another strike against that. more tension! thanks for making this extremely uninteresting “artist” a little more fascinating to watch. Actually, Taylor Swift has KE in the ascendant. But in any event, nodes with strength in the 1/7 axis can often generate some charisma. For Bieber, it’s exalted RA in the 1st, while for Swift it’s RA with dig bala in the 7th.